No one knows who was the first person to set foot into what is now "Virginia," or when they got here. The first Virginian had no concept they were crossing the boundaries of future political jurisdictions to arrive in Virginia perhaps 15,000-20,000 years ago. There was no grand entrance, and certainly no "Welcome to Virginia" sign. There was just one small step to cross a line that would be not be drawn until English kings made specific grants of land in 1632 (Maryland), 1663 (North Carolina), and 1681 (Pennsylvania/Delaware), or the US Congress defined boundaries of new states in 1792 (Kentucky), 1796 (Tennessee), and 1863 (West Virginia). Paleo-Indian foraging bands might have entered the state from the northwest, traveling eastward along the glacier's melting edge until crossing the Eastern Continental Divide to enter Virginia via the headwaters of the Potomac River. The band included women and children in addition to men. Gender roles may have resulted in men doing the long-range scouting and hunting, and women gathering the plants. If so, then a woman - perhaps accompanied by one or more children - may have been the first person to cross into Virginia as she searched for new sources of food and medicine. The first humans to enter Virginia may have been following a herd of caribou migrating along the edge of retreating glaciers 18,000 years ago. Those humans could have seen where the Teays River was blocked by the ice sheet and carving a new channel, now called the Ohio River. 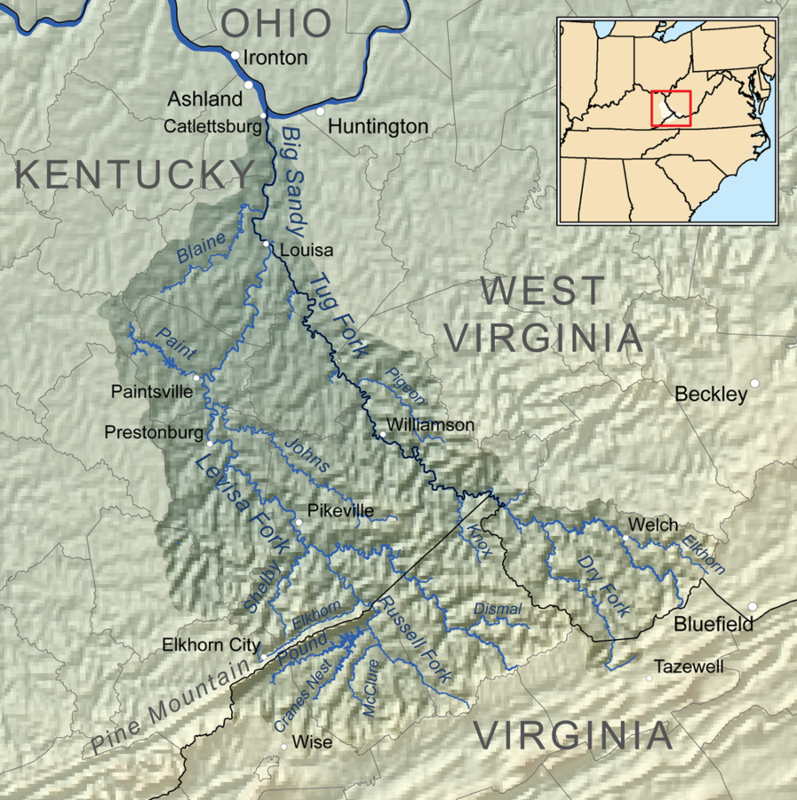 The band could have walked upstream along the Kanawha River to the southern remnant of the ancient path of the Teays, ironically called the New River now. If so, they would have entered Virginia at the edge of modern-day Giles County. Perhaps the first group to arrive followed a different tributary of the Ohio River. If they had walked along what today is called the Tennessee River, they would have entered Virginia's southern edge via the Powell, Clinch, or Holston rivers. 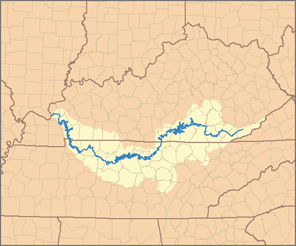 If they chose the Cumberland River, the crossing could have been west-to-east through the Cumberland Gap. A hunting trip 15,000-20,000 years ago up the modern Big Sandy River could have led to a border crossing via the Russell Fork into Dickenson County at Breaks Interstate Park, via the Levisa Fork into Buchanan County, or via the Tug Fork and then Dry Fork into Tazewell County. A group hunting and gathering food could have explored north from Florida, following the coastline. If so, they walked along the Coastal Plain into what today is the Outer Continental Shelf 30-40 miles off Virginia Beach. 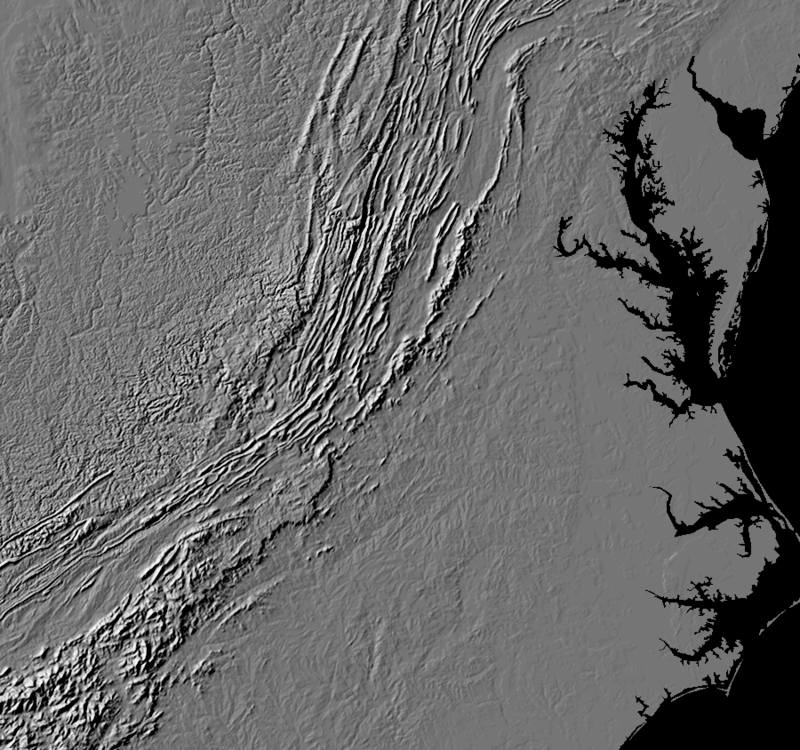 Sea levels were about 350 feet lower; the eastern edge of Virginia at that time is now close to the edge of the Continental Slope. The initial arrivals could have walked inland, moving through the forest and up what is now called the Chowan River before branching off to the north at the Nottoway or Meherrin rivers. 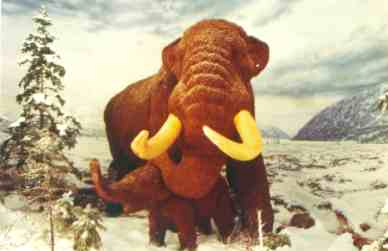 That would match the location of the oldest documented site of Paleo-Indians within the modern boundaries of thestate. 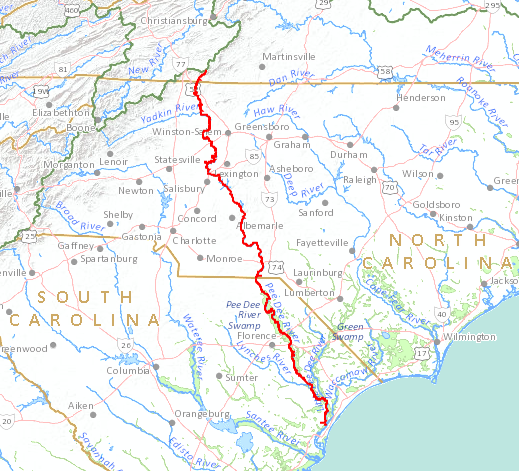 If the first Virginians had traveled even further upstream in the Roanoke River watershed, they would have crossed a future border between North Carolina-Virginia into modern Brunswick or Mecklenburg counties. Perhaps a group headed out of the river valley towards the setting sun, but ran into the Blue Ridge. 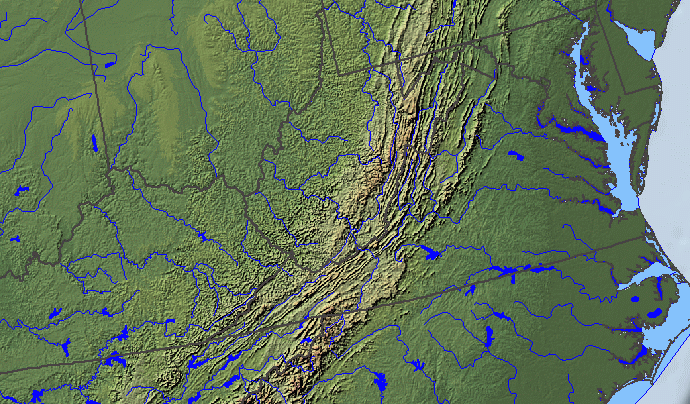 The mountains could have diverted a group up the Dan River into Halifax County. Others may have walked up up the Ararat River into Patrick County. One possibility: the first Virginians arrived as a family unit, traveling south along the Atlantic Ocean shoreline rather than following any river channel. A hunting band may have tired of trying to spear caribou or musk ox near the edge of the ice sheet, and ventured east until they reached the Atlantic Ocean. If such a group had walked south along the shoreline, they would have crossed into modern Accomack County on the Eastern Shore. As an alternative scenario, maybe the first Virginians came from the south. They could have followed the ocean shoreline north through North Carolina into what today is Virginia Beach. The new Americans reached Monte Verde at the southern tip of Chile by 12,500BCE (Before Common Era). It is possible that the migrating hunters and gatherers raced south, after emerging from thousabds of years of isolation in Beringea 15,000 years ago, and got to the tip of South America in just 2,000 years. As an alternative, maybe the first hunting bands arrived in North America around 20,000 years ago, bypassing ice sheets that closed off the land route at the peak of the Last Glacial Maximum. That scenario provides 2,000 years for humans to walk to Cactus Hill, on the banks of the Nottoway River in Virginia's Sussex County. An earlier arrival date would provide 5,000 years for humans to walk to Meadowcroft Rockshelter, southwest of Pittsburgh. In 1970, a deep-sea scalloping vessel dredged from the ocean bottom a large bi-pointed knife. 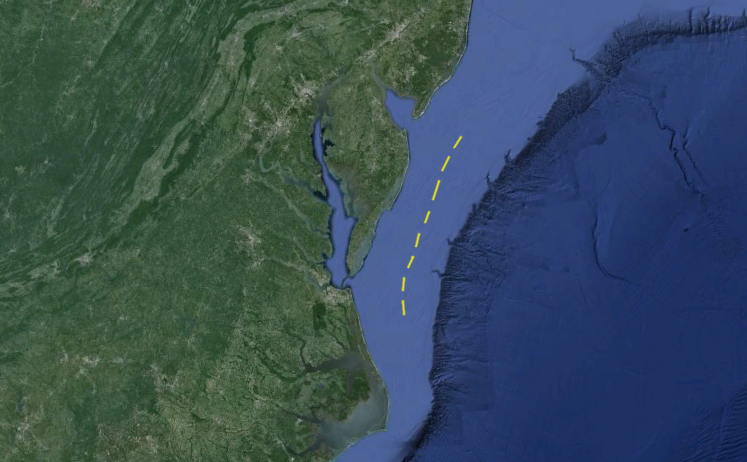 The discovery site is located near the edge of Virginia’s continental shelf and is approximately 40-nautical miles east of the modern coastline. 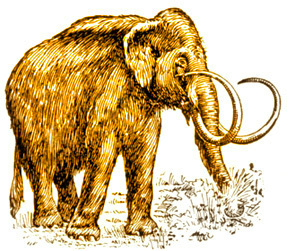 The knife was dredged from beneath 228 to 240 feet of water, and along with it the scallop vessel exhumed a virtually complete mastodon (Mammut americanum) skull. Based on the Middle Atlantic sea level curve and given the depth of the finds, the last time the discovery site was a dry upland landscape would have been well over 14,500 years ago. More importantly, the area was nearly four miles east of Virginia’s Clovis-age 13,200-year-old coastline. On the other side of the North American continent, some paddlers from Siberia and Japan might have migrated across the Pacific Ocean at the edge of the ice, as the Laurentide Ice Sheet retreated and rising waters created the Bering Strait. If the first Virginian crossed the modern state boundary at the Atlantic Ocean coastline, they did so before the ice sheets retreated into Canada. The first Virginian did not see the barrier island at Assateague, or the "Green Sea" marsh between the Back Bay and the Dismal Swamp. Solutrean Hypothesis- Were the First Virginians From Europe, Rather than Asia? Who Was The First European Child Born in "Virginia"? Why Didn't Virginia's Natives Sail East to Europe, First?